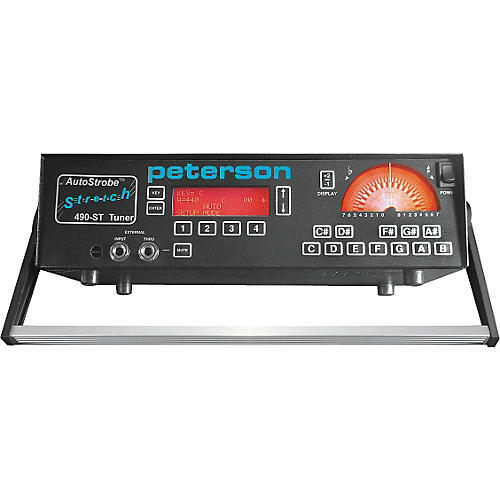 The Peterson 490-ST AutoStrobe Tuner includes stretch tuning capabilities for enhanced tuning of stringed or percussive instruments such as the piano, bass, guitar, marimba, steel pan, and others. Only Peterson strobe tuners respond at the speed of light to display relative tuning of any audio source to 0.1 of a cent (1/1000 of a semitone) accuracy. With the new AutoStrobe models such as the Model 490ST, students, technicians, and musicians at all levels can utilize automatic (handsfree) note selection for fast, accurate tuning of instruments. This feature also permits realtime display of intonation to improve performance and listening skills while playing. Tables with optimized tunings for all piano types and sizes takes the drudgery out of piano tuning. Up to 31 additional files may be programmed by the user. The 490-ST has internal compensation for optimal viewing over a wide range of source pitch and volume. +2/-1 display feature shifts the strobe patterns into more visible middle ranges. Bass note patterns can be displayed two octaves higher and treble note patterns can be displayed one octave lower in strobe display. For inline, silent tuning during performances.